For the fourth year in a row, The Market has been dubbed champion in the 6th Annual Downtown Burger Battle presented by the South Dakota Cattlemen’s Foundation. 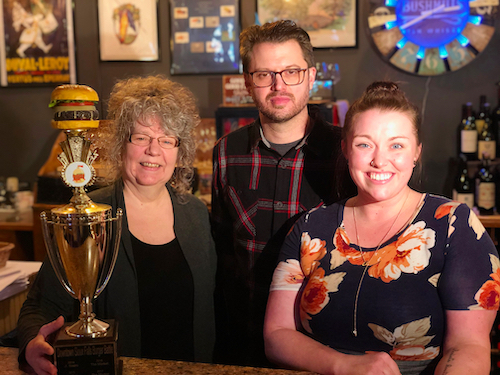 The 6th Annual Downtown Burger Battle kicked off January 2, 2019 and continued through the month of January. Participating restaurants exemplified breadth and variety of downtown dining by showcasing the classic American burger. Customers who bought a burger tasted and rated up to five points in each of five categories for every featured burger they try. 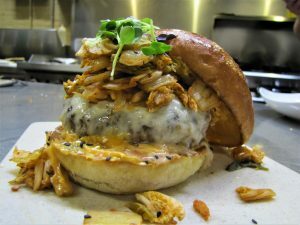 The burger with the highest average points is crowned Downtown Burger Battle champion. The winning “Go-chu Burger” made up 1,160 of the burgers purchased this year. “This means everything. As a new chef stepping into this and three wins from the previous [years], I was stepping into big shoes to fill so I was nervous. But in the big picture, January is one of those months that can be really slow. It was the exact opposite of that. We’re really happy to see the turnout and business was robust and everybody had a really great time. ” — Chef Matt Regnier, The Market. The Go-chu Burger: Using local ingredients, the wagyu beef is smothered in house-made kimchi, smoky provolone, radish micro greens and gochujang aioli, with the bun dusted with wasabi powder for that simple finishing touch. In second place was Ode to Food & Drinks with Bread & Circus Sandwich Kitchen closely following in third place. Honorable mentions for specific category winners are: Ode to Food & Drinks rated highest in customer service and Blarney Stone Pub rated highest in toppings. This year shattered previous records of participating restaurants and total burgers consumed. During the month of January, a total of 8,123 burgers were sold and rated from twelve participating restaurants. Compared to 2018, in which 3,317 total burgers were sold from six restaurants. “The Cattlemen’s Foundation is proud to partner with downtown Sioux Falls and the terrific restaurants that participated in the 2019 Burger Battle. The community of Sioux Falls is fortunate to have so many choices in the Downtown area loaded with talented and creative chefs that have a unique ability to showcase South Dakota’s biggest and tastiest agricultural product; beef! Congratulations to The Market on their win in 2019 and we’re already excited for 2020!” — Ryan Eichler, President, South Dakota Cattlemen’s Foundation. The Market will keep the traveling Downtown Burger Battle trophy until next year. The 7th Annual Downtown Burger Battle is set for January 2020.